We here at Xanaland understand the complexities and ups and downs of being in the Seattle grunge scene, and also as the widow of Andrew Wood, I myself understand what it's like to feel left behind. Jason has persevered and become a wonderful human being, It makes you realize that people really do have their own destinies, so congratulations Jason from us here at Xanaland, I only met you once, but I'm sure I speak for the entire Seattle music scene when I say we are very proud of you! 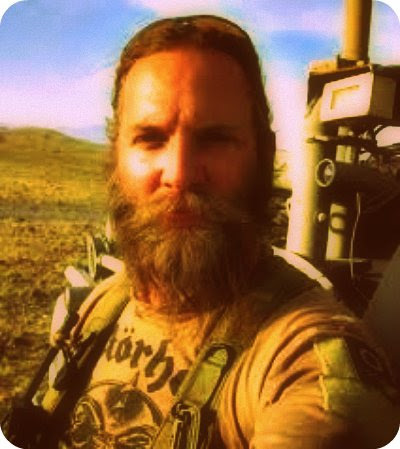 NEW YORK, May 7, 2013—Military veteran, rock guitarist and monk, Jason Everman raises the bar for the modern Renaissance man. In 1987, Everman—a commercial fisherman off the coast of Alaska—quit his job and moved to Seattle where he became the second guitarist touring worldwide and recording with Nirvana to promote their “Bleach” album and a bassist with Soundgarden on their “Louder than Love” tour. He eventually outgrew the rock scene, and in 1994, he traded his pick for a rifle and enlisted in the U.S. Army special operations forces as a part of the 2nd Ranger Battalion. Thirteen years later, Everman, 45, who has hiked the Himalayas and lived as a Nepalese monk, will graduate from Columbia University School of General Studies with a Bachelor of Arts in philosophy on May 20 at 9 a.m. in New York City. Everman, who reenlisted in 2000 in the U.S. Army special operations forces and deployed to Iraq and Afghanistan, considers the completion of his bachelor’s degree the final step toward achieving a well-rounded, wholeness in his life. “Throughout my adult life I have made the conscious effort to develop three aspects of who I am: the artist, the soldier and the philosopher. I believe GS has been the ideal place to realize this development,” Everman said. While enrolled at Columbia GS, Everman, who was an active member of the U.S. Military Veterans of Columbia University student organization, composed and recorded a song entitled, "Catch & Release,” for the soundtrack, “A Marine's Guide to Fishing,” an award-winning short film starring an Iraq veteran. He also participated in the New York University Veterans Writing Workshopwhere he published two stories in the 2009 and 2010 anthologies entitled, “The Meantime,” and “Summation,” respectively. After graduation, Everman plans to travel and hopes to publish a novel and apply to a graduate degree program in history. The School of General Studies of Columbia University is a liberal arts college in the United States created specifically for students with nontraditional backgrounds seeking a rigorous, traditional, Ivy League undergraduate degree full- or part-time. GS students take the same courses, with the same faculty, and earn the same degree as all other Columbia undergraduates. For more information about Jason Everman or the School of General Studies graduation, contact Anna O’Sullivan at 212-854-7671, or email ao2255@columbia.edu.